Scientifically designed to produce maximum flavor and taste, blu electronic cigarette cartridges are made in the USA by Johnson Creek Smoke Juice. WOW! The atomizer is built into the e-cig cartridge - meaning a new atomizer and maximum vapor with every e-cig cartridge you use! Industry recognized as the leader in American made electronic cigarette smoke juice. Master mixers make each batch fresh, by hand. 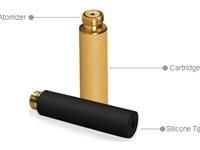 Our e-cigarette flavor cartridges are made specifically to work with blu products. blu e-cig flavors made in Wisconsin by Johnson Creek. U.S.A. ingredients that are propylene glycol free. Our ingredients are listed above at cartridge technology.